Margaret Hain is proud of her service in the military. After graduating from high school in 1941 she spent a year at Boston University where she wanted to study to be a dietitian. Things for her didn’t turn out quite that way. “I went to work in a defense plant to earn more money for college,” the 89-year-old Port Charlotte resident said. “I worked as a tool grinder in a General Electric defense plant in Lynn, Mass. I ground tools for aircraft. “I wanted to join the WAVES, but I couldn’t get out of my defense plant job. I wrote to President Roosevelt knowing he was the boss of everything. I thought maybe he could get me out of the defense plant and into the Navy. “I received a handwritten letter from the President. He said I was better able to help my country staying where I was as a tool grinder in a defense plant. I got so irritated I tore his letter up. “The Navy kept calling me asking why I signed up but never showed up? I explained I was being held hostage by my bosses at the defense plant. 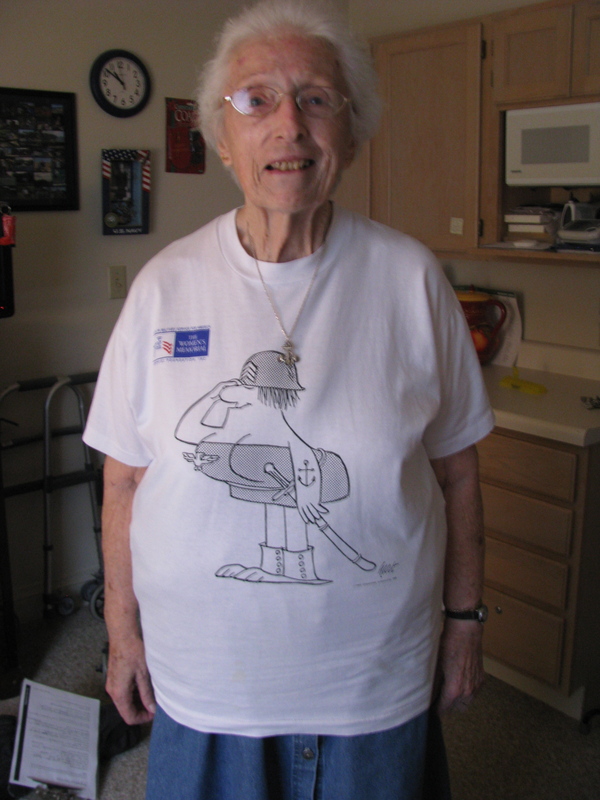 It took two Navy captains to rescue me and walk me out of the defense plant,” Margaret recalled 70 years later. “Because I was only 20-years-old my father had to sign me into the Navy. At 20 a girl had to get their parents permission. However, boys could sign by themselves when they were 18. This was discrimination against women back then. “My father had been a veteran of WW I. He served as a radioman aboard a sub chaser during the First World War,” she said. “He was so proud of me. My mother had a fit. “I went to boot camp at Hunter College in the Bronx, N.Y. for eight weeks. The Navy took over the college near Yankee Stadium for the duration of the war and turned it into a boot camp for WAVES. “Because I wanted to become an occupational therapist I was accepted for training in the Navy Hospital Corps at Bethesda, Md. I got there in January 1945. After training there I was sent to St. Albans Naval Hospital in St. Albans, NY. “That’s where Jackie Robinson, the baseball player, came from, she said with a smile. “In those days we had to make up or own drugs for the patients, we also made oxygen tents for patients who needed them. The patients’ rooms had to be ship shape by 9 a.m. It was hard work but I enjoyed it. “One patient sticks in my mind after all these years over all others. He was an RAF (Royal Air Force) pilot from England. His name was David and I’ll never forget him,” as tears welled up in her eyes. “He was incapacitated when we got him. Eventually through therapy he was able to walk,” she said. “One day the surgeon in charge of that ward asked David if he could walk from his bed to the door where he and 20 other officers were convalescing. ‘I don’t think I can make it,’ the RAF pilot told the doctor. “‘I know you can make it,’ his doctor replied. “They dressed him in his Class-A, full dress, RAF uniform that was very attractive,” Margaret recalled. “As we all watched, David walked slowly to the door. Someone outside opened the door and their stood his mother and father. They had been flown to the United States from England as a surprise for the wounded flyer. “So many things happened when I was in the WAVES I can no longer remember,” she said. 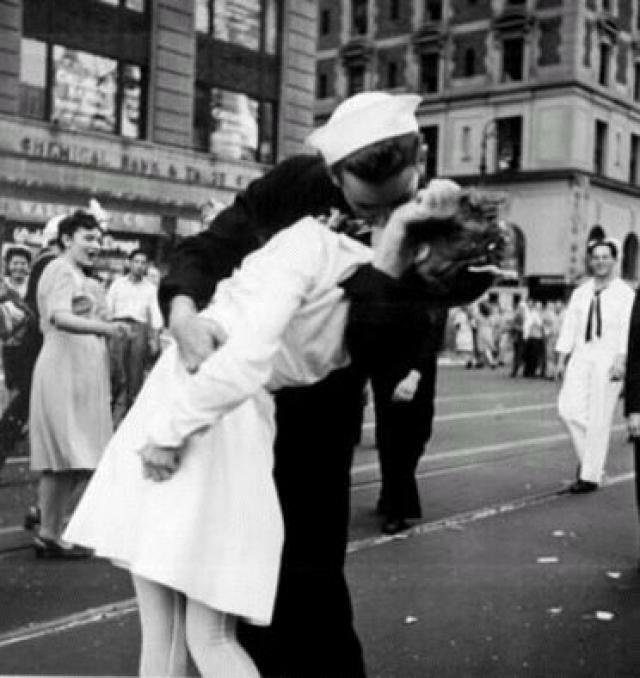 But I do remember that ‘Unconditional Surrender’ photograph taken of a sailor kissing a nurse in the middle of Times Square on VJ-Day, Aug. 15, 1945 that made all the papers. It’s a small world some times. “Three decades later, Margaret and some others formed a veterans club for women who served in all branches of the military. This was in the 1970s and the group held their meetings at the American Legion Post in North Port. “I met the same nurse at the club we formed in North Port for women veterans,” she said. Margaret distinctly remembers when news the Japanese surrendered, ending World War II, came over the hospital’s P.A. system while she was on duty one night. “When the patients heard the news the hospital became bedlam. It was wonderful,” she said. 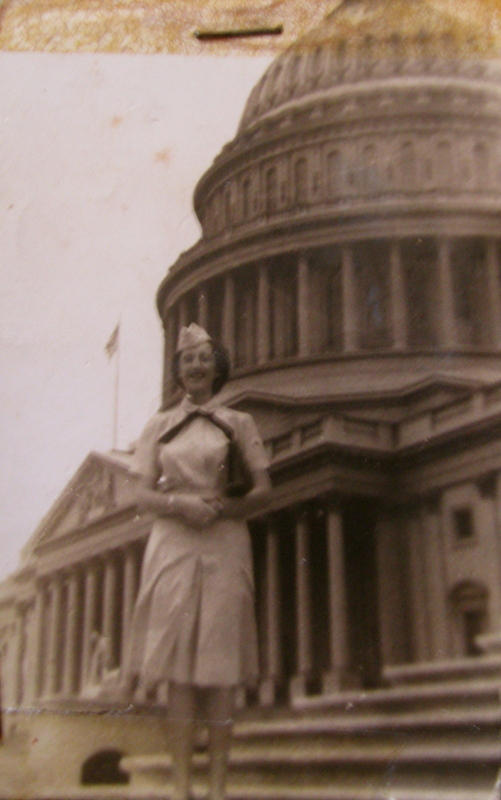 Before she could be discharged from the Navy, Margaret and the other nurses who worked at the hospital had to spend two weeks at special training in Manhattan. They were being trained how to be civilians again. At least, that’s what the Navy said it was doing. By then she was 21 and an old married lady. She married George, a Marine who spent three years fighting Japanese in the Pacific during the war until he was wounded and wound up at St. Albans Naval Hospital where the two met. They had two children, Eileen and Judy. By the time Margaret moved to Port Charlotte in 1959 George died and her daughters were still young. They went to Charlotte schools and excelled. Eileen spent three decades working for Lou and Frank Desguin, the Charlotte County Property Appraisers. Judy, her younger sister, joined the service and became a combat medic during the Vietnam era. She died on June 3, 2011 from conditions associated with her service in the military. This story was first published in the Charlotte Sun newspaper, Port Charlotte, Fla. on Wednesday, Aug. 21, 2013 and is republished with permission. A fascinating story. I am planning an article for a guest post at Greatest Generation Lessons about women in WWII, would you mind if I add a link to this post? You have every reason to be proud of your grandmother. Margaret is a grand old lady and a good story teller.